Mosaic Monday ~ Apple Blossoms | The Happy Wonderer ~ ellen b. Please visit Mary at Little Red House to join in or to see more mosaics. Have a wonderful Taxes are due week everyone! 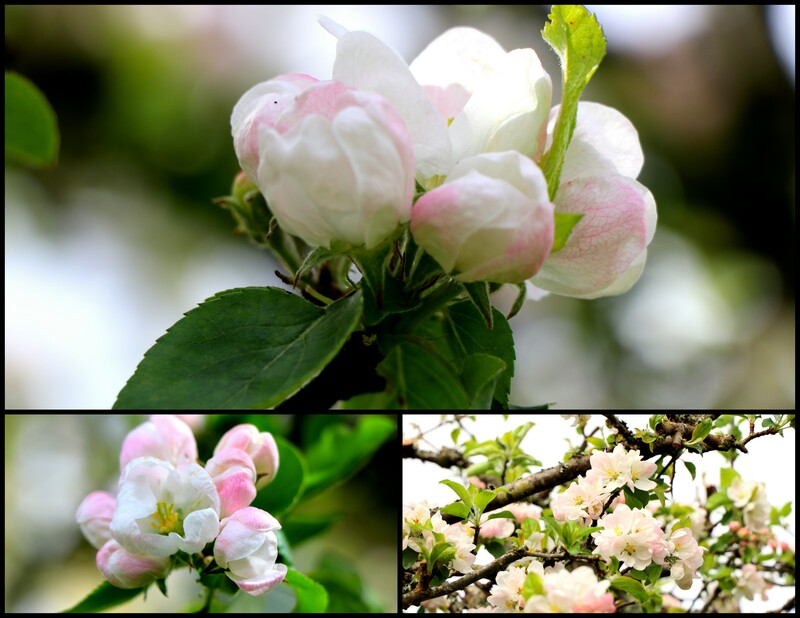 Posted on April 11, 2010 by Ellen •	This entry was posted in Mosaic Monday and tagged Apple Tree Blossoms, Apple Trees. Bookmark the permalink. I love apple blossoms, they make such a lovely carpet on the garden or grass. Beautiful mosaic. The apple trees should be blooming here in NH this week. I can’t wait! I’m sure the bee’s are excited too. OUTSTANDING!!! Makes me wish we had an apple tree!!! Oh. it is so wonderful to see apple blossoms! Thanks for the reminder. I think?! Your mosaic is so beautiful and perfect for this time of the year! Oh I just love these gorgeous pictures! It really is such a joy to see all these springtime images in blog-land at the moment. That blue sky in the center sets off the whole mosaic just beautifully! Oh boy … all those blossoms and the wonderful apples that will come! Yummy! Beautiful mosaic..so nice and clear!